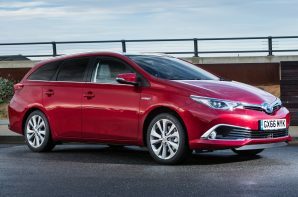 Toyota has made some major changes to the latest Auris, and the estate model, with the aim of making a car that is lower, lighter and with the same spirit as Toyota’s sports models. For the first time the Auris is available with Toyota’s hybrid system which mates a 98 bhp petrol engine with an 80 bhp electric motor and tried and tested nickel metal hydride batteries. Toyota thinks that a whopping 45% of Touring Sports buyers will go for the hybrid model, and every one of them will be built in the UK as the Derbyshire factory supplies the whole of Europe. With a blank piece of paper and the latest hybrid system, the smaller battery pack now fits under the rear seats providing the same boot space as conventional models. Speaking of which, despite the name suggesting otherwise, this is actually a very practical estate with 530 litres of boot space increasing to 1,658 litres with the rear seats folded. However it’s not all positive, thanks to a dashboard that would have looked a bit old hat in the previous model and material quality that is an improvement but is still below class standards. The Auris Touring Sports is a step forward but unfortunately the whole market has moved forward too. As a result it remains off the class pace in too many areas. However it has one ace card, and that is the combination of the hyper-efficient hybrid drivetrain with an estate body. If you can look past the interior and you’re happy to drive conservatively, the Auris is a genuinely practical and efficient estate.